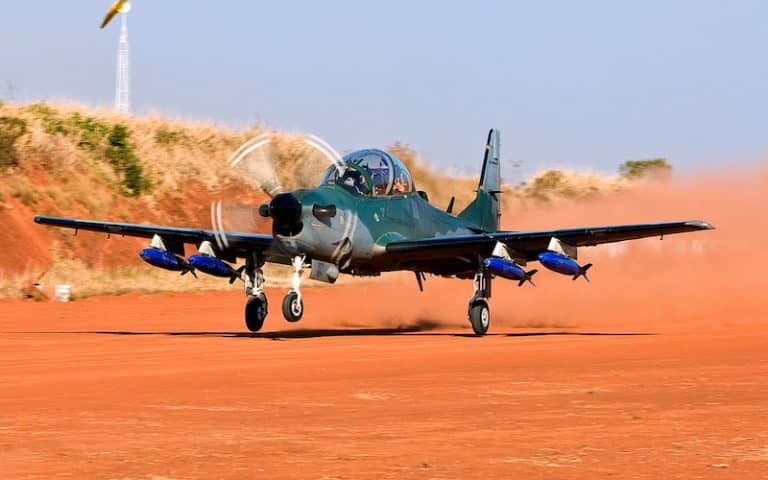 Brazil’s Embraer and partner firm Sierra Nevada Corporation (SNC) have confirmed the contract for 12 A-29 Super Tucano aircraft on order for the Nigerian Air Force (NAF). Although the contract was awarded in November 2018, the two companies officially confirmed it on 6 February. The A-29 is conducting combat missions on a daily basis in theatres around the world. It has more than 46,000 combat hours and more than 360,000 total flight hours. With the Nigeria order, the A-29 has been chosen by 14 air forces worldwide. On 28 November 2018 the United States Department of Defence placed the $329 million contract with Sierra Nevada Corporation to manufacture the NAF’s 12 Super Tucano. The contract is worth $329 076 750 for the aircraft, although the total not-to-exceed amount is approved at $344 727 439 and is to include Forward Looking Infrared (FLIR) systems for six of the aircraft. These systems will be funded soon after the initial contract award. The Department of Defence said that work is expected to be completed in May 2024. The Nigerian Air Force in December 2017 received letters of offer and acceptance for the Super Tucano deal. In August 2017 the Nigerian deal was valued at $593 million and included Paveway II guided bombs, laser-guided rockets, 12.7 mm ammunition, unguided bombs and infrared sensors. Some of this may be acquired under separate contracts. On 6 February the US Department of Defence confirmed that Nigeria will be getting the Advanced Precision Kill Weapon System (APKWS), which upgrades 70 mm rockets into laser-guided weapons.